The space: Big -- 6,000 square feet big, with room for 170 diners (the patio will seat almost another 40). 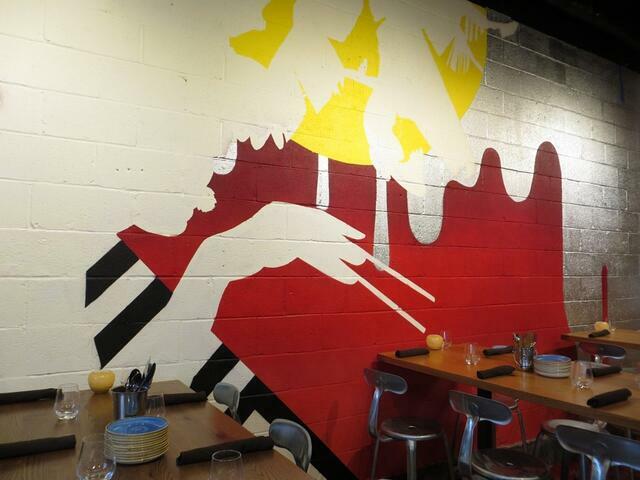 You'll notice the murals and art adorning the wall, as the art is just as important to Palette 22's mission as the food. The restaurant even has a permanent arts director, Cara Leepson, on staff. When it opens, Palette 22 will feature the creations of 14 artists, selected from about 50 applicants who hailed from within 90 miles of Shirlington (the inventory and artists will change about every three months). The artists will be required to be in the restaurant two shifts a week, working on their craft at one of two easel stations while surrounded by diners. Their art will be for sale, and can be added to your bill for easy purchase. "A gallery can kind of be intimidating," Leepson said. "It's making it really accessible." Much like the embedded artist spaces, the kitchen is wide open to diners -- the better to watch staff playing with such toys as the Marra Forni brick oven and Autodoner, a sort of vertical spit that will be used for shawarma and tacos al pastor. Think global street food, an admittedly wide category. "It took a little while for us to wrap our brain around it," Duncan said. The wide array of small plates -- around 30 -- includes Argentinian empanadas, Japanese takoyaki (kind of like a stuffed pancake, with octopus, ginger and bonito), Baja fish tacos and South American seviche (in both vegetable and seafood varieties). This is an excerpt from an article posted on WashingtonPost.com. For complete article, click here.